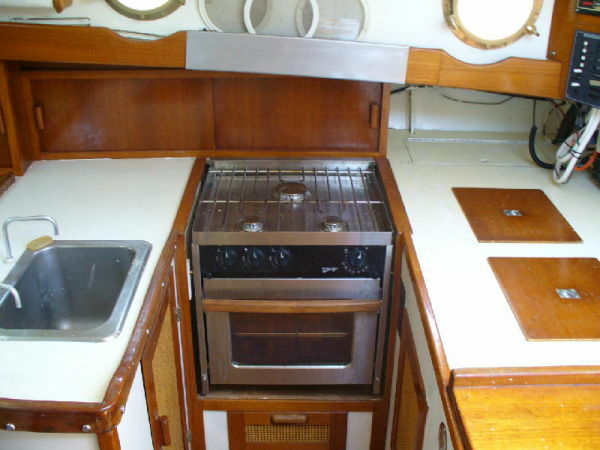 LOA: 42' LWL: 34' Beam: 11' 2"
Entering from the cockpit and down 5 steps you will find the galley to starboard and the Navigation station to port with engine room aft. 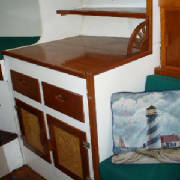 Moving forward to port is the fold down dinette with settee and another settee to starboard. 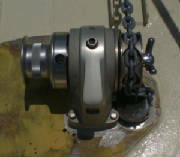 The head and shower are forward to port followed by the V-berth with anchor chain locker access. 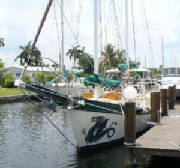 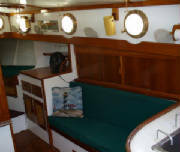 Aft of the engine room is the master stateroom with large double berth and abundant cabinets, drawers and storage areas as well as a separate companionway to the cockpit. 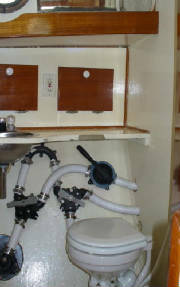 The entire vessel has 20 screened opening ports and 2 large hatches for excellent ventilation and beautiful Parquet floors. 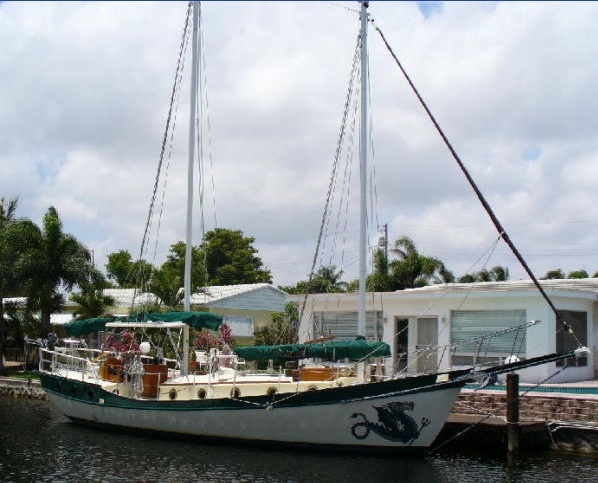 After going sailing on this junk rig cruiser, I was amazed how easy it was to set the sails. 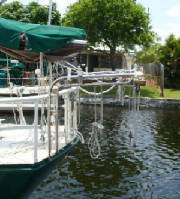 Once set the boat just takes off with very little heel and a delightful motion. 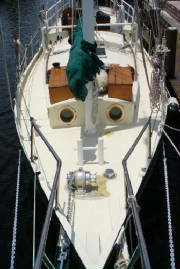 Tom Colvin originally designed this junk schooner to be easily sailed by one person and to be a strong world cruising vessel with a very traditional look. 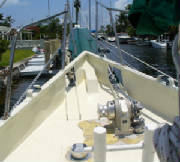 Her shallow draft and full keel gives her a rare ability to navigate in close to shore. 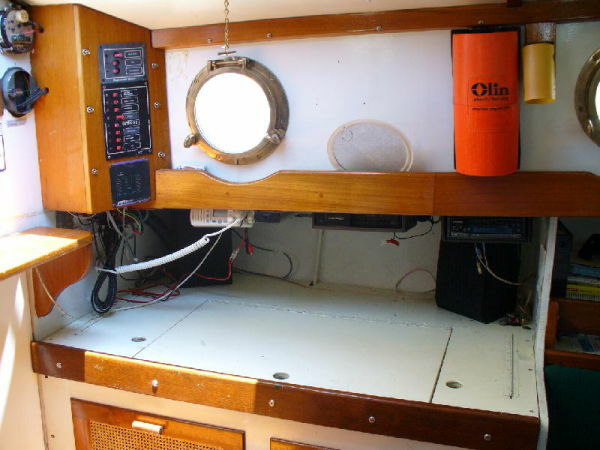 Her wide open flush cockpit and aft deck area allow unencumbered space for lounging and storage of toys. 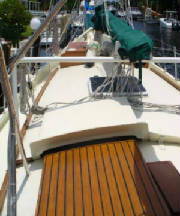 The Colvin Gazelle Schooner will draw attention in any port around the world with her low freeboard, long bowsprit and traditional lines.